We have seen that the nature of Reality or Sachchidananda (Existence—Consciousness—bliss) has been interpreted by Sri Aurobindo as ‘Sat—Chit-Shakti—Ananda’ or ‘Existence—Consciousness-Force—Bliss’. Consciousness does not only denote ‘awareness’ but also simultaneously implies ‘energy’ or ‘force’ or ‘action’. This is needed to make the awareness effective or else consciousness would have remained in a poise of immobility and inaction. It is Consciousness-Force that builds the universe. Whatever exists is a formation of Consciousness-Force. The human being is a particular formation at one plane. What we term as God or Divine is also a formation of a different magnitude at another plane. Thus, the essence of ‘God’ and ‘man’ is the same. That is why Indian spirituality considers the human being to be intrinsically and potentially divine. The Consciousness-Force builds the worlds and spans from the ‘Superconscience’ of the yogis to the ‘matter’ and ‘inconscience’ of the materialists. From the yogic viewpoint, what we call ‘inconscient’ is not an absence of consciousness but a masking, a veiling of consciousness. The Inconscience is phenomenal, not fundamental. The Yogi who comes into contact with the Higher end of Reality –with Sachchidananda, is more at ease with an intuitive realisation of the ‘consciousness’ aspect of Chit-Shakti. As this experiential realisation surpasses the usual cognitive repertoire, it is often perceived as a blank or zero or Nihil. This Nihil is not an absence of consciousness but a Superconscience that has surpassed our usual cognitive notions of consciousness. At the other end, the scientist who is in contact with the ‘materialistic’ end of Reality is more at ease with the ‘Energy’ aspect of ‘Chit-Shakti’ in matter and the inconscience because that is what is discernible to the probing of science. Science studies matter and inconscience in the form of a mechanical energy that is automatic, brute and inert. To the scientist, matter and inconscient are devoid of consciousness. Sri Aurobindo explains that in matter and inconscience, ‘consciousness’ is present as a veiled, hidden, ‘ involved ’ knowledge on the basis of which the ‘energy’ component performs its functions with perfect precision. If that precise working is even minutely disturbed, there can be havoc. Thus electrons rotate in orbits in consonance with laws that are precise, perfect and immaculate. The slightest manipulation of that balance can result in a nuclear explosion. The same phenomenon continues when life manifests in matter. The cell with its protoplasm and nucleus has its own biological balance working out a secret knowledge inherent in the substance of ‘life enmeshed in matter’—a slightest disturbance in this balance can lead to a malignant growth! And when we proceed even further than the individual cell and study a ‘species’, we find that that there is also a ‘secret’, involved, implicit knowledge present as ‘instinct’ which the energy of the species works out with geometrical precision. Thus, consciousness is present in matter and inconscience as an ‘involved’ knowledge-potential supporting a mechanical energy. This phenomenon is so exact in detail and precision that when science unravels it, the world ‘discovers’ the scientist to be ‘brilliant’ whereas he has just ‘unraveled’ the working of the cosmic ‘intelligent-will’ implicit in matter. However, at the level of the human mind, the ‘consciousness’ (Chit) and ‘energy’ (Shakti) get separated, delinked, detached from each other. ‘Consciousness’ expresses itself through cognition and emotion while ‘Energy’ becomes ‘will’ or ‘volition’. This de-linking was necessary so that they develop to their fullest potentials. At the level of matter, the Chit-Shakti works in limited circles, following rigid, inflexible laws. At the level of the lower animals, the ‘instinct’ is a sort of progress over the ‘blind’ energy of matter as evident in the building of an anthill or the architecture of a beehive. Still, the intelligent-will at the level of ‘instinct’ runs within limits and circles and is limited beyond a determined point. It is only the human being who has the full flexibility of developing his ‘intelligence’ and ‘will’ to unfathomable heights, breaking all limitations. But this ‘flexibility’ has come at a price of sacrificing the ‘knowledge’ that was spontaneous, automatic and implicit with the mechanical ‘will’ in nature. The task set out for man is to re-integrate ‘knowledge’ and ‘will’, Chit and Shakti at a higher level of Reality. Because man has the immense privilege of developing ‘consciousness’ and ‘will’ to their fullest potentials, this reintegration will be rich, variegated and fulfilling. It will give a meaning to an otherwise meaningless existence. It is also interesting to note that the dichotomy between ‘consciousness’ and ‘will’ at the level of the human mind results in psychology having a somewhat amorphous, mixed, indeterminate field which lacks the precision of mechanical nature. That is why the psychologist cannot showcase his findings with the precision and accuracy of the material scientist. That is not a drawback of psychology as a discipline. What can the psychologist do if the automatic ‘intelligent-will’ operative at the level of material nature become detached and delinked at the level of the mind? But this also means that psychology can get stagnated and unprogressive if does not aspire to synthesize ‘knowledge’ and ‘will’ at a higher level of Reality. In doing so, psychology will have to overstep its boundaries and tread the path of a consciousness paradigm. This is why transpersonal psychology grows in momentum. This is the rationale of developing a consciousness-based Integral Yoga Psychology. In fact, one of the most important reasons of imperfection and disharmony in human civilization is the dichotomy between ‘knowledge’ and ‘will’. The dichotomy is absent at the level of mechanical nature where knowledge is a mechanical intelligence implicit in the workings of an apparently inconscient, mechanical energy. The dichotomy is absent too at the superconscient Sachchidananda where ‘consciousness’ and ‘energy’ are two poises of the same Reality. 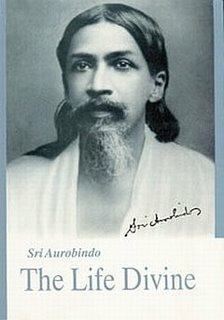 Sri Aurobindo explains that the dichotomy between knowledge and will cannot be fully healed at the level of the mind because mind is a divisive principle. What is the remedy? Sri Aurobindo answers that if knowledge and will need to be synthesized perfectly in our human life (and not in a distant spiritual summit), then that endeavour needs a principle higher than the mind for its effectuation and expression. This higher principle has been named by Him as the supramental principle or ‘supermind’. He has previsioned that in the next stage of evolution of consciousness, the supermind will be established and consolidated in the earth consciousness just as matter, life-principle and mind-principle were established and consolidated in the earth consciousness. This supramental principle will establish on earth, in life, the synthesis of knowledge and will—a synthesis that already exists in the Chit-Shakti (or Consciousness-Force) poise of the Sachchidananda Reality. Only then ‘knowledge’ can be automatically effective and ‘will’ can be spontaneously luminous. The Force of Existence thus becomes a CONSCIOUS FORCE. The Life Divine is actually a blueprint of this evolutionary endeavour and charts a map of consciousness to manifest the supramental consciousness in human life. By Light we live and to the Light we go..